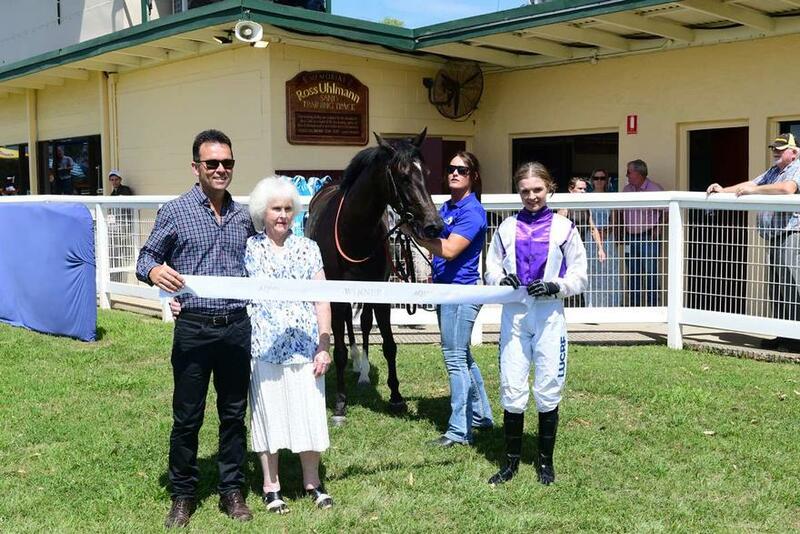 Munce Racing apprentice Montanna Savva celebrated a winning return to the saddle when she kicked home a winner with her first ride in over 12 months at Beaudesert on Saturday. The 21-year-old had only recently made the decision to make a comeback as an apprentice and combined with the Munce trained MINI MOUNTAIN to score by 3 lengths in the DONALD IBLE MEMORIAL Maiden Plate (1100m). The race was named after Donald Ible, a local owner, breeder and lifelong racing fan from Jimboomba who passed away on Thursday morning at the age of 77. It was also an emotional day for his wife and son (pictured) who were trackside alongside extended family for the race yesterday. Montanna then backed that performed up with a narrow third on KOSCIUSZKO EXPRESS in her only other ride of the day. Montanna, who has already recorded 23 wins as an apprentice riding throughout different parts of Queensland prior to arriving with Munce Racing, has been riding trackwork for the stable for the past year after putting her apprenticeship on hold. But after recent discussions with trainer Chris Munce, 21-year-old Montanna decided to again pursue her apprenticeship and got back into the swing of things with rides at the Doomben jumpouts and Deagon barrier trials over the past fortnight. She also has three rides at Bundaberg on Melbourne Cup day. Congratulations to Monty on a winning return and Congratulations to the winning owners of MINI MOUNTAIN: Mrs A T Durrington and Mr B H Durrington.